Menelaou, K., M. Yau, and T. Lai, 2018: A possible three-dimensional mechanism for oscillating wobbles in tropical cyclone-like vortices with concentric eyewalls. J. Atmos. Sci. doi:10.1175/JAS-D-18-0005.1, in press. What does it mean for a hurricane to “wobble”? The authors are examining a very specific kind of wobble, also known as a trochoidal oscillation. Here’s an animation to give you an idea of what a trochoidal oscillation looks like! As you see in the animation, a trochoidal oscillation is what you’d get if you put a sticker on a barrel and then rolled the barrel across the ground. It’s the sum of two types of motion: the rotation around the edge of the barrel, and the straight-line path that the center of the barrel takes. That animation is just a sketch, so let’s take a look at trochoidal oscillations in real hurricanes! Here is the path of Hurricane Carla (1961), where the “path” of a hurricane is defined as the trajectory of the eye, or very center, of the storm. The thin black curve (the one marked with I, II, III, and IV) shows that Carla’s path that looks a lot like a trochoidal oscillation. This is telling us that, in addition to moving in a relatively straight path, the eye of Hurricane Carla was also moving in a circular fashion. You might now be wondering what that looks like. Here’s a more recent satellite video of Hurricane Wilma (2005). Starting at 0:15, you can see that the eye, or cloud-free center, of the hurricane is wobbling in a way that suggests a trochoidal oscillation. 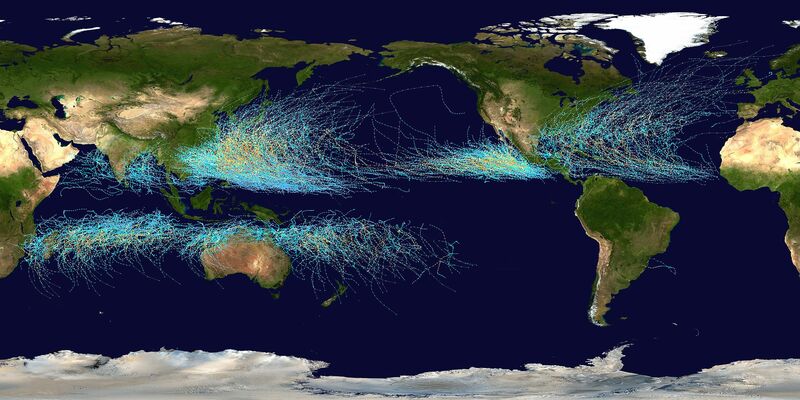 Hurricane wobbles are cool, but why do we need to understand them? We can only forecast hurricane wobbles if we understand how they work. Especially for something as dangerous as a hurricane, it’s important to forecast its track as accurately as possible! Understanding the wobble can help meteorologists make better predictions for where exactly a hurricane will make landfall. I grew up near Orlando, Florida, and in my experience, even small changes in a hurricane’s track can make a big difference. For instance, Hurricane Charley was expected to make landfall near Tampa back in 2004, so a lot of petroleum gas was diverted from Orlando to Tampa in order to help Tampa prepare for the hurricane. However, Charley changed its track! It made a near-direct hit over the Orlando area instead. As a result, we experienced a gas shortage in addition to the hurricane damage, which slowed down our recovery. Even small departures from a hurricane’s forecasted track can have lasting impacts on unprepared cities. Is there a pattern to when hurricanes wobble? When scientists start to explain a phenomenon we don’t understand, finding patterns can be a very helpful jumping-off point. We usually see trochoidal oscillations in hurricanes that have a certain type of structure, which suggests that this structure might play an integral role in causing these wobbles to occur. This structure is known as a secondary eyewall. In the image below, you can see the secondary eyewall in Hurricane Maria (2017). Starting from the center of the storm and moving out, you can see the eye, the primary eyewall, the moat, and the secondary eyewall. The eye of a hurricane is its clear, cloud-free center. It’s surrounded by the primary eyewall, where you find the strongest winds and rain. The primary eyewall is surrounded by the moat, which is a relatively calm region. And around the moat, you can see the secondary eyewall! This is a second ring of very strong winds and rain, and it makes the hurricane look like a bullseye. Primary eyewall and secondary eyewall in Hurricane Maria (2017). Warmer colors correspond to more severe weather. Image credit: San Juan Radar Station (TJUA). We usually see trochoidal oscillations in hurricanes with secondary eyewalls, so Menelaou and his co-authors focused on these kinds of hurricanes. The authors used computer models to simulate trochoidal oscillations and determine how the secondary eyewall are causing these wobbles. Trochoidal oscillations are caused by waves! Not this kind of wave. The Great Wave off Kanagawa, Hokusai. Image credit: Wikipedia. You might be thinking of waves on the surface of the ocean, but the specific kind of wave that causes a trochoidal oscillation is a little different. It’s called a vortex Rossby wave, or VRW. Surface gravity waves, like the one above, are caused because gravity acts as a restoring force that pulls the water back down after the wave crests. Vortex Rossby waves have a different restoring force that’s related to the incredibly strong counter-clockwise rotation you see in hurricanes. The authors simulated vortex Rossby waves in their hurricane model. The primary eyewall generates vortex Rossby waves that travel out to the edge of the hurricane, while the secondary eyewall can generate vortex Rossby waves that travel inward to the hurricane’s center. When two of these waves, traveling in opposite directions, combined in just the right way, the researchers observed wobbles in the simulated hurricanes. In summary, sometimes the strong rotation of a hurricane can act in concert with aspects of its structure and make the storm wobble. This study sheds some light on how this process might work, and hopefully this work can be continued in order to improve our forecasts of how hurricanes move!